State Farm survey finds 2 out of 3 Canadians say people drive terribly once the snow flies. AURORA, ON, Nov. 3, 2015 /CNW/- The weather last winter was terrible in most provinces across the country, so it's no surprise that 82 per cent of Canadians dislike driving in the winter. Blizzards, freezing rain and ice make driving difficult, and winter driving requires people to be focused, eliminate all forms of distraction and concentrate on the road. According to findings from a national State Farm survey, 86 per cent of Canadian drivers believe they are good drivers, but come the first snow fall, 66 per cent say people drive horribly, like they've never seen snow before. "Winter is a fact of life in Canada, and it's obvious that the majority of Canadians are uncomfortable driving in the winter for a number of reasons," says John Bordignon, Media Relations, State Farm. "Shorter daylight hours, driving through snow, scrapping off ice, cold temperatures and sudden weather changes are factors that affect driving conditions and a person's mood behind the wheel. All the more reason to not let things like phones, noisy passengers and pets distract you from the road." What's the biggest concern for Canadians while driving in the winter? Forty five per cent say they find it hardest to drive when there's black ice, followed by freezing rain (23 per cent). Seven out of 10 (73 per cent) dislike driving during the evening, and 36 per cent of respondents indicated that speeding and over confidence are bad things while driving in the winter. Transport Canada advises installing four winter tires on your vehicle when temperatures begin to consistently hit 7°C. Winter tires provide improved handling and braking capabilities on ice, snow and slush, however 25 per cent of survey respondents say they do not use snow tires. People can also prepare for winter driving by checking the weather forecast before heading out and making sure they have a fully charged mobile phone in case of emergencies or breakdowns, windshield washer fluid, a blanket, flashlight and first aid kit. Drivers should also be aware of bridges, overpasses and other shaded areas, as these parts of the road tend to freeze more quickly. 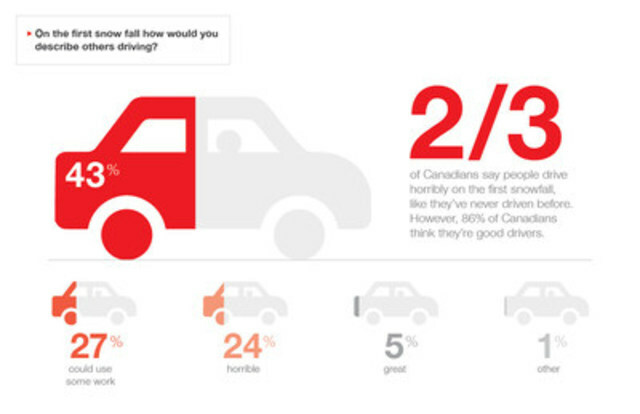 This is the last of three news releases (spring, summer, winter) State Farm has distributed in 2015 revealing survey results and the opinions of Canadians about their driving habits and road safety. The online survey, conducted in February, 2015, polled 1,300 respondents of driving age across Canada. This press release was distributed by State Farm Canada prior to its brand transition to Desjardins Insurance. Desjardins Group is the leading cooperative financial group in Canada and the fifth largest cooperative financial group in the world, with assets of $276.3 billion. It has been rated one of the Best Employers in Canada by Aon Hewitt. To meet the diverse needs of its members and clients, Desjardins offers a full range of products and services to individuals and businesses through its extensive distribution network, online platforms and subsidiaries across Canada. Ranked among the world’s strongest banks according to The Banker magazine, Desjardins has one of the highest capital ratios and credit ratings in the industry.